Yes, it's another Captain America toy. No, this one doesn't turn into a wolf. Recruited by Nick Fury for an undercover mission, Captain America serves SHIELD in the pursuit of justice. For those keeping track at home, that's a reference to Brian Michael Bendis' Secret War story (not to be confused with any of the various Secret Wars stories, which were much more cosmic in scope and have an S on the end of the title). 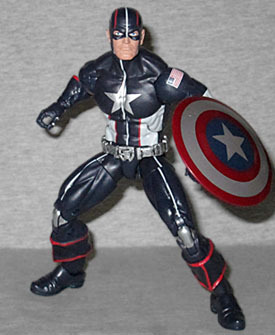 For some reason, out of all the characters who wore variant costumes in the series, Cap is the only one who gets made into toys. No Spider-Man, no Luke Cage, no Daredevil, no Wolverine, no villains, just Captain America. There's this Marvel Legend, the Minimate, and then nothing else. It's kind of hard to build a team out of just one guy, you know? Give us more, toy companies! Perhaps unsurprisingly, all of this figure's parts are reused. 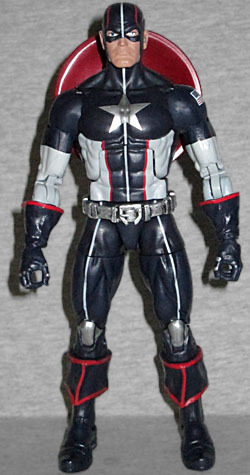 Like Capwolf, he's built on Hasbro's medium body, and gets the flared gloves and folded boots we've seen before. 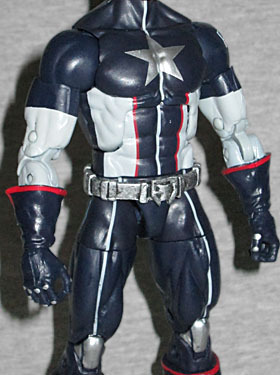 Even his plain, unadorned head has been released in the past - you'll recall it from the Ultimate Captain America figures. Wait, his belt is new! So not everything is reused. Secret War was about Nick Fury sending a group of superheroes into Latveria to overthrow the government. Since they were supposed to be operating undercover, they all got new stealth costumes. Well "stealth" costumes, because it's not like they really changed that much. One of the heroes Fury rejected for the mission was Ben Grimm, because he was "too visually distinctive," but Cap is still wearing a costume with pirate boots, white stripes on the abdomen, and a giant star on the center of his chest? Who is going to be fooled by that? Most of the suit is dark Navy blue with red and gray piping. His star is silver, as are the stylized wings on the sides of his mask. He has silver knees and knuckles, and an American flag tampographed on his left shoulder. The articulation is as you'd expect: swivel/hinge rocker ankles, swivel shins, double-hinged knees, swivel thighs, balljointed hips, swivel waist, hinged torso, swivel/hinge wrists, double-hinged elbows, swivel biceps, swivel/hinge shoulders, hinged neck and balljointed head. All the joints worked fine, straight out of the box. The lower pin of the right knee joint is a little loose on mine, but not to the point where it can't hold a pose or the figure can't stand - you just don't feel the ratchety bit moving when you move the leg. 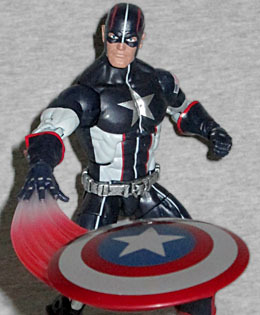 Captain America comes with his shield, and though it's the same mold we've seen so many times, it's done in darker colors than usual. He also gets one alternate hand, and it's something entirely new! It's the right hand, with the fingers splayed, and a translucent swoosh trailing off the front. The shield can plug into that, creating the impression that he's just thrown it. The effect is red near the tip, where the shield would be, and fades to clear (or at least "clear-ish") as it gets toward the fingers. This will probably not be the last time we see this piece, which is good, since you can't very well put this blue hand on a normal Cap's red glove. He also comes with a piece of this series' Build-A-Figure, Abomination. He gets the right arm, which is giant and scaly and will probably be pretty cool once we get the whole big thing assembled. It's nice that Hasbro found a way to release yet another Captain America that isn't just yet another Captain America, but unless they make some other Secret War toys, he's going to look out of place.